A Santa Barbara Obon photo from the 1950s. On any given weekend during the summer, residents of the greater L.A. area can participate in Bon Odori at two or three Buddhist temples within driving distance. But for members of Santa Barbara Buddhist Church, there hasn’t been a Bon Odori in almost a quarter of a century. The 24-year hiatus will end on Saturday, July 20, with festivities beginning at 1 p.m. and dancing at 4 and 6 p.m. The final dance practice will be held on Friday, July 19, from 6:30 to 8 p.m. The church is located at 1015 E. Montecito St. Originally located at 131 E. Canon Perdido St., the church was founded in 1922 and moved to its current site in 1966. The Obon Festival was once a lively affair attended by hundreds; a 1981 photo shows taiko drumming in Santa Barbara’s De la Guerra Plaza, across from City Hall. But in recent years, “people have been asking us, ‘Are you going to do Obon again?’ ‘When is Obon?’ It’s still in the mind of people around Santa Barbara,” he said. The songs are from the standard Buddhist Churches of America Southern District repertoire, including “Obon no Uta,” “Tanko Bushi” and “Tohoku Ondo,” the latter dedicated to the victims of the 2011 earthquake/tsunami in northeastern Japan. Entertainment will be provided by, among others, Togen Daiko from Oxnard and Fuji Japanese Music and Fuji Japanese Dance, whose teacher, Mme. Kimisen Katada, is based in Ventura. For more information, call (805) 483-5948, email [email protected] or visit www.buddhistchurchofsantabarbara.org/obon. 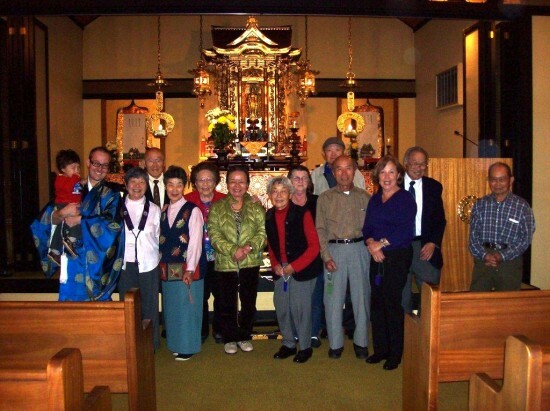 Members of Buddhist Church of Santa Barbara’s current congregation. Rev. Henry Adams is on the left. I’m always happy to see when old traditions are kept alive and perpetuated for the young generation. Good job Santa Barbara Buddhists!